Cthulhu Live: Muerte al Chupacabras! For three decades, Hobbsbad, New Mexico, has lived in fear of El Chupacabra, an unseen monster that comes in the night and feeds on blood. Every few years, the attacks become more frequent, and then stop just as quickly and mysteriously as they began. Nothing has been able to stop this malevolent creature. Now, one man has done the impossible and captured El Chupacabra alive, and tonight, he plans to reveal his prize to the world - or at least the highest bidder. Hobbsbad has been thrown into chaos, as crackpots, cryptozoologists, reporters, and ranchers swarm into it! Muerte al Chuparabras! is a scenario inspired by B-movies and pseudoscience that is designed to be played with 15 or more players and two to four staff members. Although it is meant to stand on its own, this script can easily be woven into any other campaign that features a lot of travel. Muerte al Chupacabras! is a Cthulhu Live 3rd Edition script that includes introduction, timeline, prop and costume information, and character stats and bios for 30 characters. This electronic script comes with three different variants - colour, black-and-white, and background-free - and each of these comes in low-resolution screen-friendly and high-resolution printer-friendly versions. 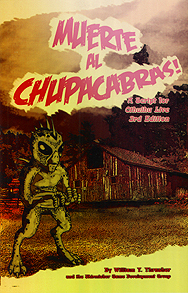 Although designed for the Cthulhu Live 3rd Edition horror live-action role-playing game, Muerte al Chupacabras! can easily be adapted for use with almost any other horror or action RPG.